Since the Family Garden Trains(tm) web site was founded in 1999, readers have been asking us where they can get the kinds of trains we discuss in our articles. In October, 2004, we started creating a series of "Buyers' Guides" featuring the kind of products folks were most likely to need when they first started out. 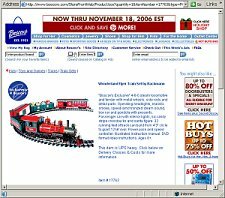 By November, 2004, the demand for Christmas Trains was so high that we added the Big Christmas Train(tm) site, which focuses on holiday and display railroads. At any given time, we are now showing something like 200 different carefully-chosen products from about fifteen suppliers, and we've become the closest thing that the Internet has for a "reference book" for several kinds of trains. Something that took a lot of work was finding suppliers whom we could trust to give our readers excellent service and who would allow us to link directly to product pages on their sites. This way we can show many quality products in a fairly limited space, while giving our readers (when possible) a choice of suppliers to check for availability and pricing. Frankly, I have yet to see anything as useful and convenient as our "check stock" buttons on any other web site. And most readers appreciate not having to spend hours surfing the web just to see what is available, and then having to track down a supplier who has that product in stock. The "flip side" of this convenience is that when you "check stock" on a supplier's page, I don't have any direct way of tracking where you went. (I suppose I could track it if I used cookies and spyware but I'm not into that sort of thing - another advantage of our sites.) That means that when you order a train from one of our recommended suppliers, I seldom learn about it until after the product has shipped. If you have a question about when a product shipped or anything like that, I will help you if I can, but your first, best bet is to figure out which supplier you ordered the product from and contact them first. To keep us in the loop and to help us know what kind of service you are getting from our suppliers, please use the form at the bottom of this page. Please let us know as much as you can about your order. That way, if you need our help with something, we have the information we need. Also, this kind of feedback helps us keep the list trimmed down to suppliers we trust (and you should probably know that we have removed a few whose customer service did not meet our quality standards). If you are NOT in North America, try contacting the Bradford Exchange office in your country or region. Bradford Exchange does not carry the same products in every country, but they may be able to help you with questions. Orders Through Amazon.com - We also link to Amazon.com for several Bachmann, AristoCraft, and Lionel products. Amazon, in turn, often links to other suppliers, but Amazon reports on shipping information no matter which supplier they use, as long as you go through their store front. An example Amazon product page is shown to the right, in case it helps jog your memory. If you bought a product through Amazon, go to the page you used to order the product, look at the lower left corner for a box labeled "Where's My Stuff?" and click on the words "recent orders." 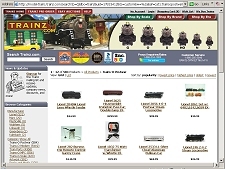 Trainz supplies Lionel and some other products, including Bachmann and AristoCraft trains. If you recall clicking on a page that looks like the one at the right, you probably ordered your product from Trainz. Their customer service contact page is at http://support.trainz.com/. Their customer service phone # is 1-866-285-5840 Mon-Fri 9a-5p Eastern Time. Boscov's is a department store that sold a few Bachmann Large Scale trains in November of 2006. If you bought a train from Boscov's, click on the words "Great Customer Service" on the lower left part of the page, or call 1-800-284-8155. Lionel sells its products through many other channels, including mail-order department stores. Several of these carry only a few trains, but we link to them to give you more chances to find the products you want. 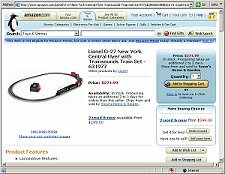 If you have ordered a Lionel train, and you didn't get it from TrainDiscounts or Amazon.com, click on the link below to see the page of suppliers we currently list for Lionel trains. Please use the form below to let us know how else we can help. The only information we have to have is your name, your e-mail address, and as much as you can tell us about the product(s) you ordered. Of course, if you want to occasionally receive e-mail announcements or "US mail" garden train product catalogs in the mail, add your mailing address to the following form. We will not sell or give this information to anyone else, but if a manufacturer gives us materials to send out to our readers, we will forward them to you. Again, please contact us with any questions about this, and feel free to add any comments in the comment box below. Please enter as much information you have about your order, including which page you ordered it from (if you can remember, your customer number (if any), the product ID (if you know it), and about when you placed your order. The more information you can give us, the faster we can track things down. Would you like to receive e-mail announcements when new articles or special announcements about Garden Railroads are available? Would you like to receive e-mail announcements when new articles or special announcements about Christmas Trains or Holiday Villages become available? Would you like to receive (by US Mail) any Garden Railroading-related product catalogs that become available? Would you like to receive (by US Mail) any Christmas Train or Holiday Village-related product catalogs that become available? What kinds of trains or other modeling interests are especially interesting to you? 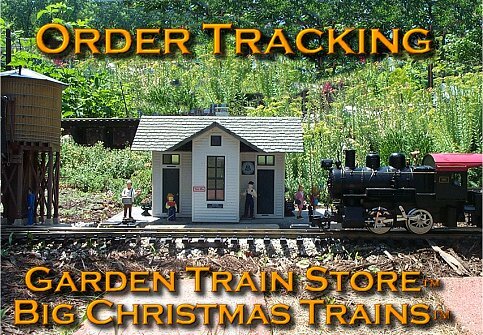 To return to the Family Garden Trains Home Page, click here. Note: Family Garden Trains™, Garden Train Store™, Big Christmas Trains™, BIG Indoor Trains™, and BIG Train Store™ are trademarks of Breakthrough Communications (www.btcomm.com). All information, data, text, and illustrations on this web site are Copyright (c) 1999, 2000, 2001, 2002, 2003, 2004, 2005, 2006, 2007, 2008, 2009 by Paul D. Race. Reuse or republication without prior written permission is specifically forbidden.